First off, I just love the title. All I could think of was some sort of hatch and match activity. I wanted it to be colorful, multi-dimensional, sensorial and instructional. Around here, I need the most bang for the buck, so to speak. I put this together quickly after searching for a good print out that went along with my Dinosaur Toob. Apparently it is not uncommon to have easter greass and plastic eggs readily accessible 6 months after Easter around here! 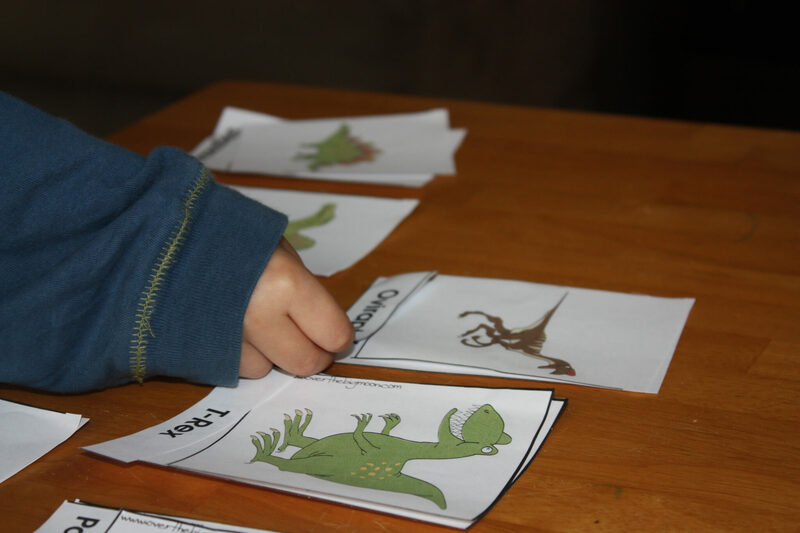 It took a little searching to find some worksheets that had enough of the same dinosaurs so that there was a little challenge but also had some good information about each one but not to much. I found these over at The Adventures of Bear. I also printed out a dinosaur unit from Over the Big Moon just in case I needed some more things to do. Usually worksheets don’t go over so well here, but he seemed unuaually interested in working on some of them. He did sit with me while I printed them off the computer so maybe that helped. While I worked on my compute, he sat next to me and worked nicely with some different activities. Sometimes he needed me and other times, he did a great job independently. While I was setting up the dinosaur hatch he put a number puzzle in order and worked on matching some three part Montessori Dinosaur cards. He even did a great job trying to match the names. 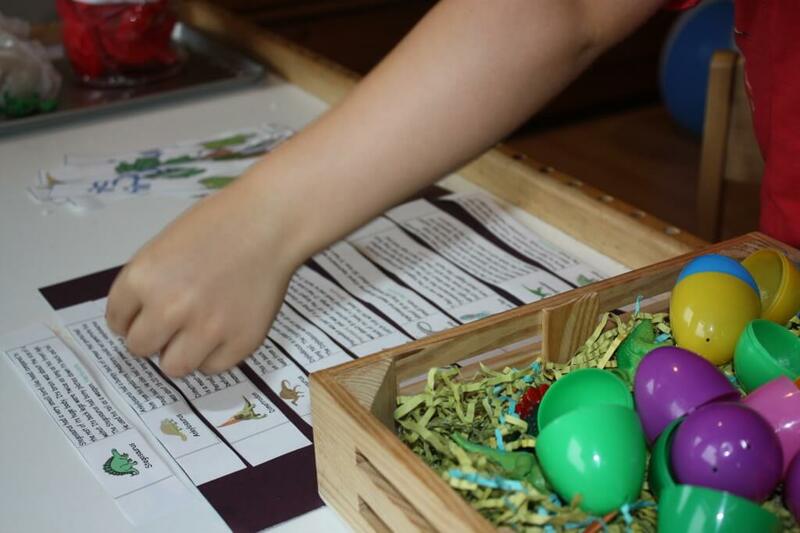 For our grand hatch and match dinosaur play activity, I cut the sheets of dinosaur facts that I printed out from The Adventures of Bear and I rolled them up into eggs. Originally, I had wanted to put the dinosaurs in the eggs, but my eggs were too small. I used a crate to make a nest out of paper Easter grass and then I burried everything. 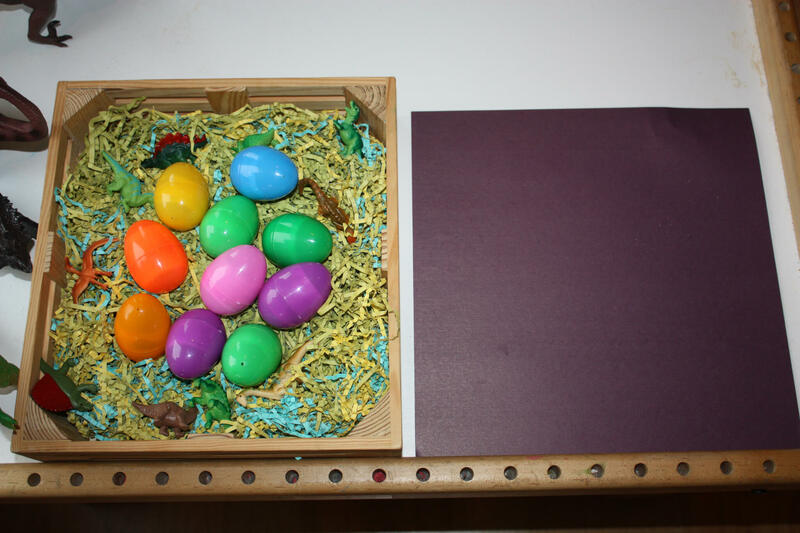 I placed a dark colored scrap booking sheet next to the crate so that the strips of paper would have a mat to be placed on and be more visible than on the white table surface. (I often use scrap book paper as work surfaces. 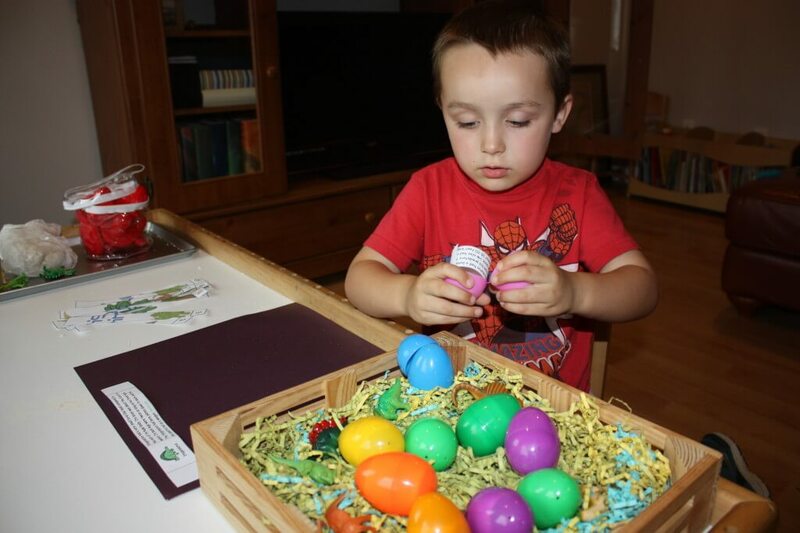 )First, he opened all the eggs and I showed him how to lay out each strip from top to bottom. Then he went about digging or “excavating” through the shreds for dinosaurs to match using his fine motor skills to open and close the eggs! 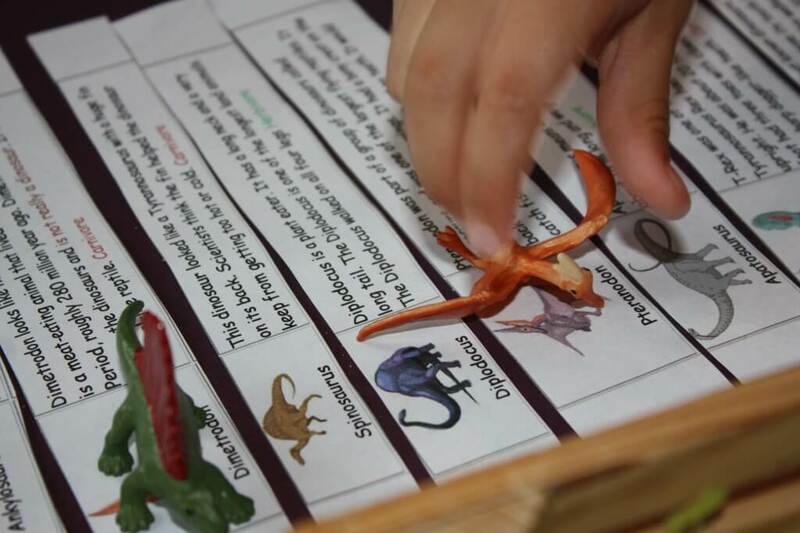 Some dinosaurs were easier to match than others since the pictures were not exact duplicates, so I showed him how we could match the features that we see the picture and the dinosaur have in common. 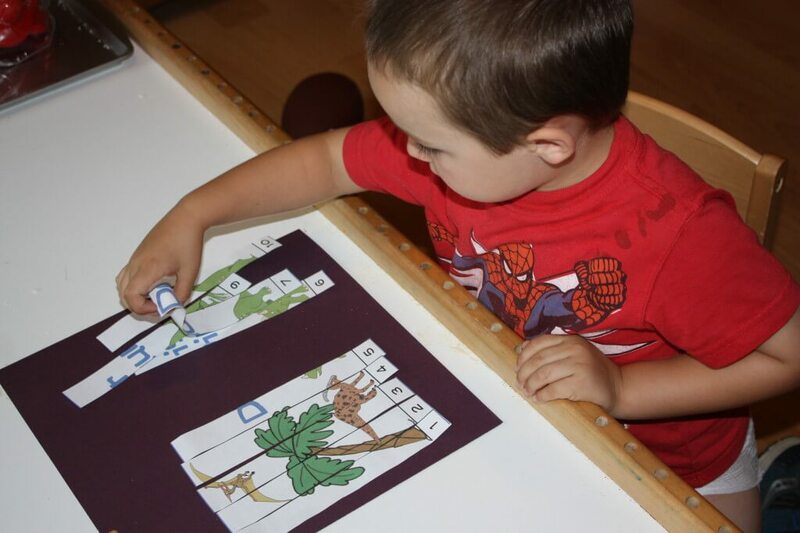 He did a great job and is really learning his dinosaurs! He went pretty quickly and got some tough ones right on the first try! 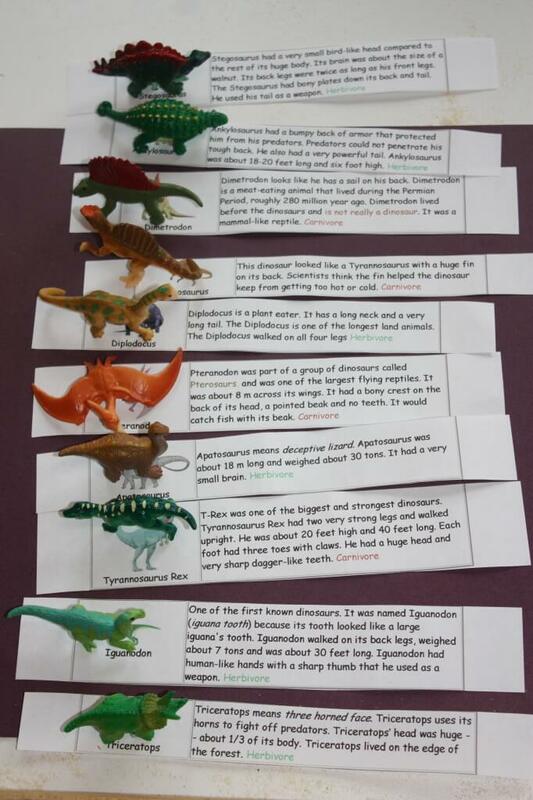 We talked about the dinosaurs based on the facts provided. I am definitely not a dinosaur expert! 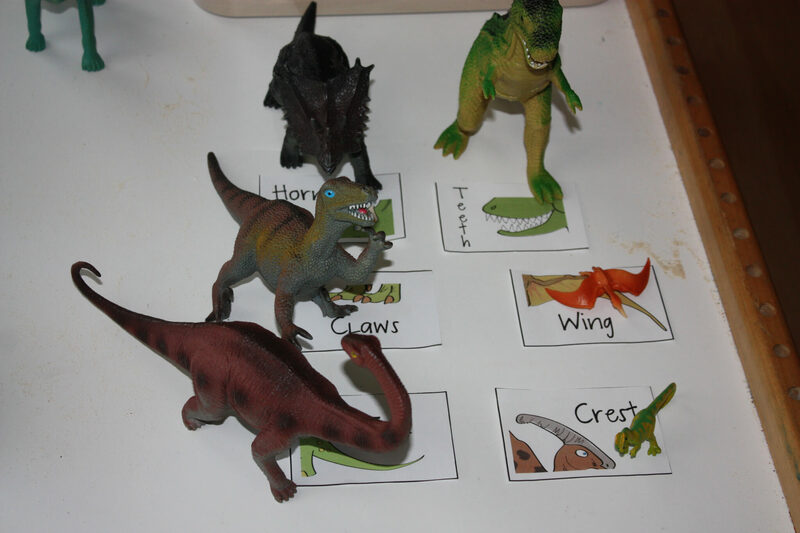 We also use some printed cards of dinosaur body parts and used our large dinosaurs to find the parts like horns, claws, teeth, scales, and tails. Later on he had fun filling the eggs with the dinosaurs that could fit or some of the grass. I love watching his skills improve. Even though it seems like they aren’t at times or are just improving so slowly, his skills are increasing or maybe dinosaurs just peak his interest! 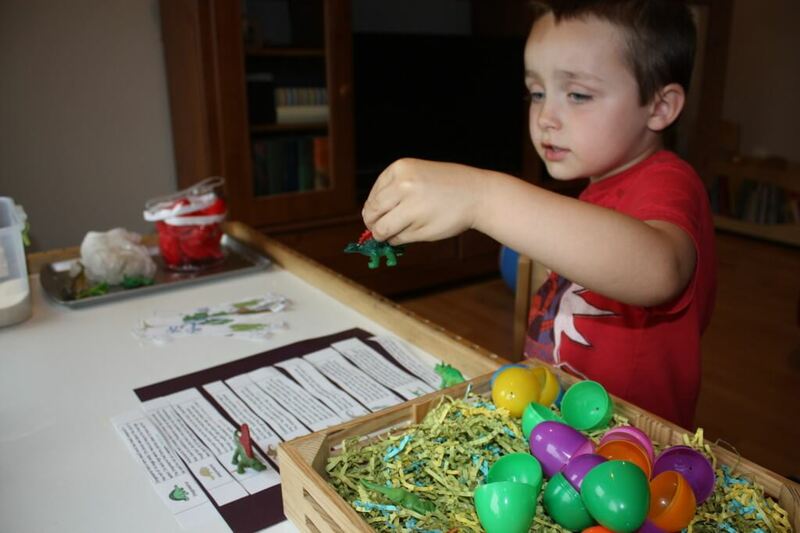 Do you have a fun dinosaur play activity your child loves? I love all the matching activities in this post! I’m featuring this in today’s linky party at Preschool Powol Packets! Your ideas are so wonderful. Thanks for the inspiration. Thank you! We work hard and have fun! SO fun! Both my boys love dinosaurs, but my youngest especially. I will have to keep the egg hatching in mind – he would LOVE it! So many people have those TOOB things…I guess I need to find a craft store coupon and start collecting, lol. Wonderful activities! 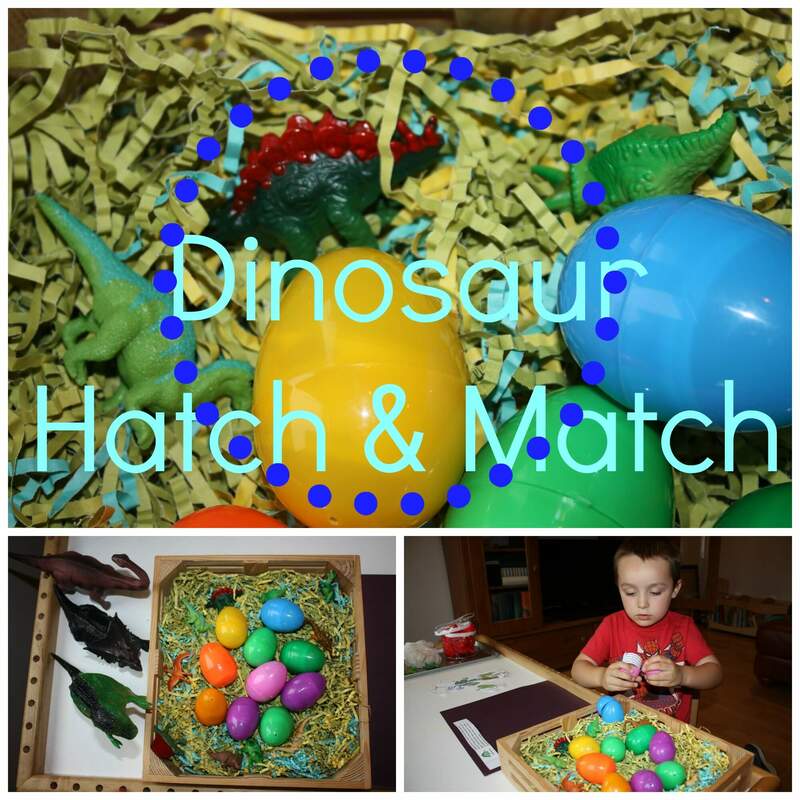 I love the idea of the Dinosaur Hatch and Match and I believe my class will really enjoy it was well. Can you inform me of where you got the dinosaur facts from? Thank You. There should be a link within the article. Thanks!